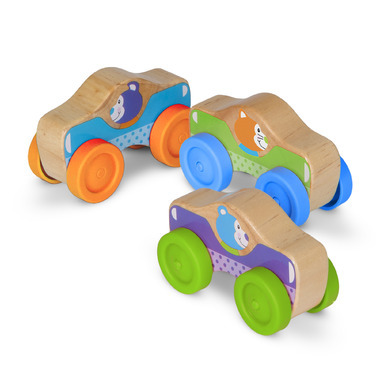 Stack, roll, and race these three wooden cars with friendly animal drivers! 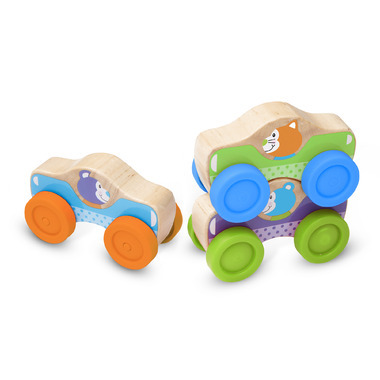 The four-inch long, brightly colored cars with art on both sides feature a clever contour that allows cars to stack in any combination Easy-roll wheels are simple for babies and toddlers to spin. They will delight in grasping, stacking, and rolling while developing gross motor skills and hand-eye coordination through imaginative play. First Play toys feature bright colors, bold patterns, and whimsical designs that boost skills while sparking imagination and wonder-right from the start!